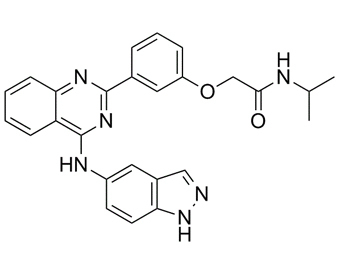 SLx-2119, also known as KD-025, is an orally bioavailable inhibitor of ROCK-II that is greater than 200-fold selective over ROCK-I (IC50s = 105 nM and 24 µM, respectively). Lee JH, et al. Ann Clin Transl Neurol. 2014, 1(1), 2-14. Zanin-Zhorov A, et al. Proc Natl Acad Sci U S A. 2014, 111(47), 16814-16819. Flynn R, et al. Blood. 2016. pii: blood-2015-10-678706.